Can't get away for professional development? Webinars provide you with the training and information you want and the scheduling you need. Participate in live webinars from the comfort of your home, or download to watch anytime, anywhere! Professional development brought to you! CompellingInstruction offers a variety of workshops on current instructional topics that impact teachers in all content areas and levels. Kelly Ferguson offers personalized individual and small-group coaching of instructional practices. Get feedback on your teaching strengths and support to improve your skills. Have an educational issue you'd like to resolve? Are you looking to improve your instruction, lesson planning, class management, assessments, use of technology or other skills? Kelly Ferguson can work with you personally to help you bolster your repertoire of instructional techniques and make your instruction more meaningful. CI? I thought you used TPRS! Among several proficient and reputed experts of TPRS (Teaching Proficiency Through Reading & Storytelling), there has been some discussion about how one defines oneself. There is no shortage of acronyms to go around, of course, but recently there has been a significant number of teachers dropping the TPRS label and instead referring to themselves as CI teachers. CI? No, people are fans of this site enough to have become CI teachers in my honor. In this case, CI stands for Comprehensible Input. Comprehensible Input isn't a technique. It isn't a method. It isn't even a philosophy. Stephen D. Krashen wrote about comprehensible input in his Comprehension Hypothesis long before I began teaching. Here is a link to Krashen's writing if you want to read the source. Since then he has refined his hypotheses to include the indispensability of compelling input. But the point is that if we are able to understand messages, and do so repeatedly enough, language soaks into our brains. This happens faster if we're interested in those messages. So claiming oneself to be a CI teacher, is a statement that a teacher acknowledges that language is acquired through comprehensible input, and that teacher develops plans in order to provide students with a maximum amount of comprehensible input. 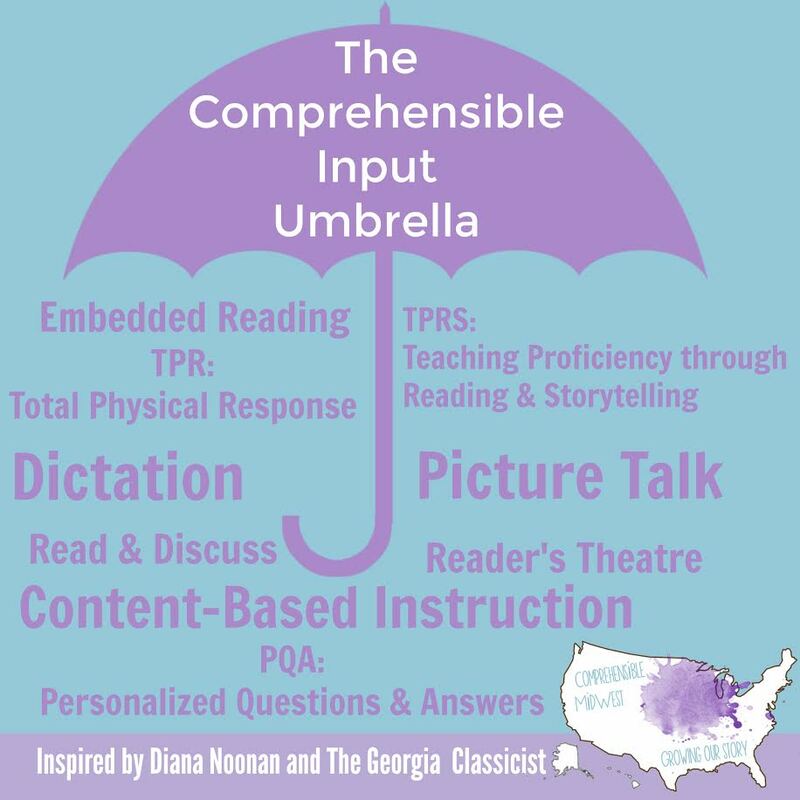 And TPRS teachers fall under this umbrella. TPRS is a specific 3-step method. And the goal of TPRS is to provide students with repetitive, comprehensible input. But why are some TPRS experts dropping that label? A couple of reasons. It is too narrow. Many teachers are moving to doing student interviews, reading and discussing novels, talking about social issues, movie talks, and a myriad of other activities that aren't technically the 3 steps of TPRS. 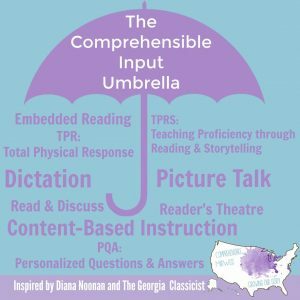 Some teachers who are well-versed in the techniques of TPRS, and who present workshops about TPRS find themselves using TPRS techniques like "circling" to discuss and converse but never truly ask a story. So TPRS feels like the wrong label. Peer pressure. I can say from personal experience that it can be tough being the only TPRS teacher in a large school in a large district. And TPRS seems like you're really bucking the system. And when someone gets swept up in the euphoria of this new method, it can be hard not to preach about the new language acquisition theory you learn. It can be hard to keep from turning others off with your born-again teacher excitement. Everyone wants to buy something, but nobody wants to be sold anything. By saying you're a CI teacher, you can point to the ACTFL position statement which few would be able to find fault with. Political Correctness. Since TPRS began growing as a method, it has faced opposition. Some thought it was just another fad. Some heard of the trend toward bizarre stories and figured it worked for clown-like teachers and looked on practitioners as the hippies of the teaching world. Some even thought it was a cult. (See the enthusiasm thing above.) It is not lightly that I say many TPRS teachers have felt like they need to stay in a teaching methods closet. It can be hard to "come out" as a TPRS teacher, especially in one's initial attempts to use this inspiring new method, before their own results can prove they made the correct decision. So, TPRS is CI. But not all CI is technically TPRS. And my thoughts? A TPRS-based class with other CI activities for variety is probably the best of all possible worlds. So what are CI activities? How does one use CI if it isn't TPRS? You'll just have to read more about that in my next update!